It is believed that breakfast is the most important meal of the day. Having said that, what goes onto one’s plate should be given a lot of importance as well. The brunch concept is spreading around many establishments around the metro and people are warming up to the idea. Brunch is a very social activity fueled by a heavy meal and often accompanied by some heavy drinking as well. Although Chesa Bianca is an old favorite, they’re not the popular choice for Saturday brunch but their opening time of 11am makes them a perfect venue to dine in for this occasion. Boom. Pan grilled tomato and all. The Rösti Oberland (P475) is what brought me to this place. A potato pancake, a slice of ham covered with baked Raclette cheese and topped with a fried egg and a slice of grilled tomato. This typical Swiss dish is comprised of all the essential ingredients of typical brunch fare: carbohydrate, protein and dairy. What more could you ask for? 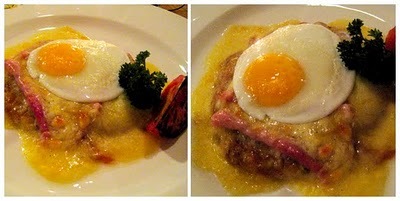 It was beautifully prepared on a warm plate to keep the Raclette gooey throughout your meal. I was so engrossed by the delicious combination; I forgot to order a glass of sparkling wine! For people out there looking for Eggs Benedict, this is something new to try. Hopefully, you get to enjoy it as much as I did. Open daily from 11:00 am to 11:00 pm, except Sundays and selected holidays, for breakfast, lunch, afternoon snacks and dinner. Wow I can't wait to try this. Great post! Looking forward to many. many, many more. It looks interesting. Would love to try this. Thanks guys, can't wait to hear about your eating experiences at Chesa Bianca! This really made me hungry while I was reading it at around 1AM , might as well go there later and try this funfare. Love the blog, I think this would be perfect with mixed berries BELLINI's or Mimosas :).